May launch a hundred ships. On what goes to her hips. Enjoys the ride with no pit-stops. Her gown will get knocked off. All in good time, (I mustn't scoff). 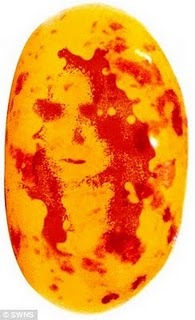 It's captured in a jelly bean! Kat is a Canadian poet, and the author of 'Shadowstalking'. A jelly bean! Fun poem, but lets hope her husband-to-be does not suffer a Wills peanut brittle!